Happy Mother's Day! This week I have featured a different mother each day. Finishing up today is the Mother of All Mothers...well, really she is just the mother of my mother. Her name is Doris Lorentzen. 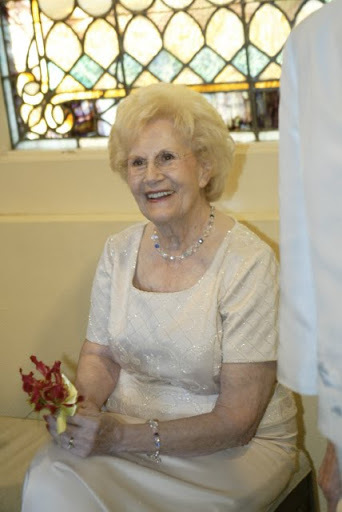 She is one of the classiest, funniest, most lively ladies I know. Absolutely fabulous. She tried to help out with the war effort by knitting socks for the soldiers in World War II. When she went with her friends to drop off their handiwork, the army wouldn't take hers...they were that bad. I'm not joking. Her conversations are full of magnificent stories like that. She personifies beauty in every way. Grandma won the love of an amazing man & he loved her with all his heart. She is the mother of 3, grandmother of 6, and great-grandmother of 6. I knew she would have a thing or two to share. This is her wisdom. Reading the previous posts reminds me that styles of mothering are as diverse as the mothers themselves. Each child is unique with his own talents, needs and personality. So just as there are no cookie-cutter mothers and no cookie-cutter children, there is no one-way-fits-all way to motherhood. Here are some thoughts on needs that children have. Security: Children need to know home is a place where they are loved, protected, and secure. It will then become a place where they want to bring their friends. Welcome that development. When our kids were in high school, it was not unusual for one of them to call at 5:00 on Sunday afternoon asking if the youth group could come over after the evening service for a fellowship. My husband would make a run to the store, I would get out the paper plates and cups, and a few hours later our house would be invaded by a large group of active teenagers. Those teenagers are grown now, but when I see one of them I'm always told how much they enjoyed those evenings. They don't tell me they remember how tidy the house was or how nice the freshly vacuumed rug was. They remember how they felt being there. Put away the breakables and let the kids in! When Ethan and Elizabeth were in high school, one summer they brought 6 of their friends to stay at our house for the weekend while they visited a local state park. I didn't mind the sleeping bags everywhere and the late-night chatter. I loved having them there. They must have loved it too, because they all came back the following summer. These days it is my four year old granddaughter Bella comes to my house and asks to 'play' my piano and "Do you have a popsicle in your freezer?" Time: Your children need YOUR time. They need to know you're spending time with them because there is nothing else you would rather be doing. It doesn't have to be a special trip or even cost money. My husband was a doctor and Kathy was very close to him. She loved going to the hospital along with her dad. She would sit in the doctor's lounge while he dictated from the charts. Often she asked to go on house calls with him & she would sit in the car while he went inside to treat the patient. ( this was a small town in the 50s - it was safe!) Who knew something so simple could become such a special memory for her? When Elizabeth was in high school an I came to Waco to visit, we would go to coffee and chat the afternoon away. I was sure once she became a busy college student it would all change. However on my first visit to Waco once she was a freshman at Baylor, she took me to Common Grounds. Those visits became routine throughout her college career. One afternoon a man interrupted us and said, " I've been sitting there watching you for quite some time. I've never seen two generations enjoying each other so much." Enjoy each other. Young mothers, be encouraged. Like all families we had problems, but we worked through those. It takes time, patience, love and prayer. You do the best you know how and trust God. When our family is gathered around the table during holidays the conversation consists of memories we of things we did and times spent together as a family. At age 87 I sit there and see love and laughter embrace 4 generations and I am a blessed woman.